Lurline's Place: WIP On One Little Project! WIP On One Little Project! Oh, this is a bit embarrassing - now where did I find this inspiration? Please tell me if it is yours! We have our RPQ show coming up in September and I have promised to donate some Lucky Door Prizes! 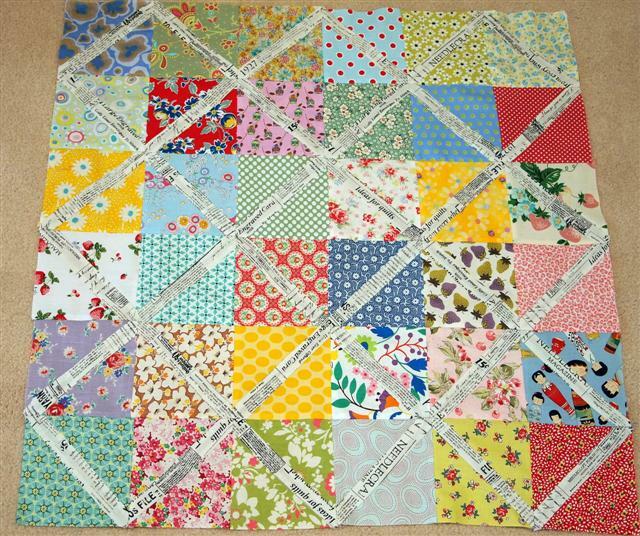 Ready to be quilted! 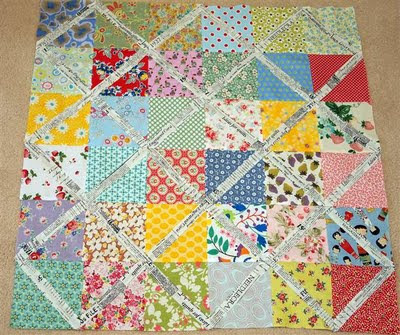 This is 30" square table topper so will be quick and easy - once I get the batting! Not perfect, but it is very effective - I enjoyed playing with the fabrics! Stitched on my new Janome 6600 - seems to like me, so that is great! We have a lovely sunny day here and it is oh, so welcome - not too cool either! Shame I haven't got all day to play in 'My Studio' - hope you are enjoying your day! what lovely projects lurline and your new machine looks a beauty,we have a lovely day here also its so nice to see and feel the sun. I think it was badskirt, check the post you wrote when you first started this. 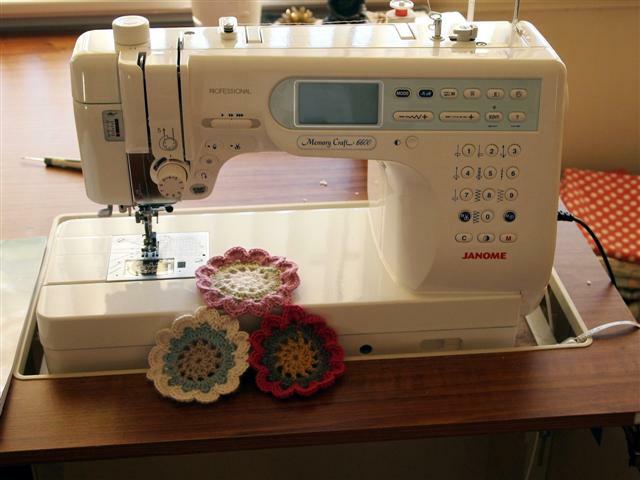 Your table topper looks very nice and I love your new sewing machine. Enjoy it making more beautiful things. Don't miss my blogiversary giveaway. Glad you've had a chance to do some sewing! Hope the new machine is purring away nicely with no dramas! oohh Love your New Toy Too...Enjoy!! It's wonderful! Love the colors! I've definitely seen a quilt like this before but I'm not sure where. Doesn't matter -- it's gorgeous! I just bought a Janome 6600, and I LOVE IT so far. It is such a fabulous machine...I am SO glad I invested in me and my machine, because I'm worth it, LOL. I didn't realize how crappy my old machine was until I started driving this one. Cute monkey and I love the quilt with the words running through it! I love both your lovely table topper and your sweet new machine. Happy sewing! so good to see you sewing again and on a new machine!!!! happy to read your posts again too! Cute little topper. Looks so sweet with the monkey. Darling little quilt. I have that same sewing machine. LOVE IT! Best wishes for Ed's homecoming. I've seen this around, but none as cute as yours! What a gorgeous littler topper. Clever you. 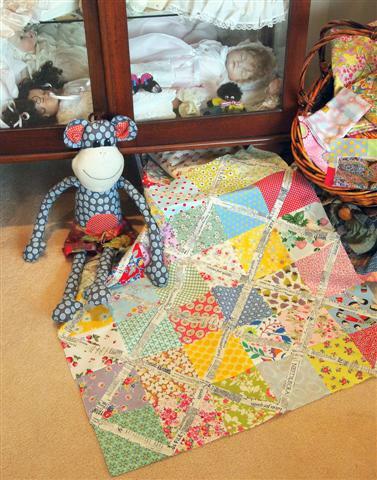 The pattern was a 'freebie' from McCall's Quilting called "Scrappity-do-dah"
I really enjoyed reading your blogs. Will visit this website again for sure.